To celebrate the 10th anniversary of the Hello! Project Kids in 2012, a book entitled Rival - 12 shoujo no 10-nen monogatari - (The 10-year legend of the 12 girls) was released. The book contains 2-page discussions between pairs of girls, covering all 66 possible combinations of them. This time around, we'll be looking into the discussion between Berryz Kobo's Shimizu Saki and ℃-ute's Yajima - the eldest 2 of both groups, and 12-nin BeriKyuu in general. Originally they were appointed for a position they were weak at, the change that occurred with these girls was...? ---Did you bring yourselves up as candidates for Leader / Captain? Or were you nominated for it? Shimizu: I was told 'Please do it'. Yajima: It happened to me naturally. I don't remember being told 'Yajima will be the leader'. Though that might actually have happened. Yajima: You know, it was like I became the leader without noticing it. When making announcements, my role was to say 'We're ℃-ute'. It just flowed from that, I feel. ---So it was something that happened naturally, huh?... (laughs) By the way, I don't think either of you are the types that'll take charge by going 'Follow me', but how do you feel on such matters when you look at one another? 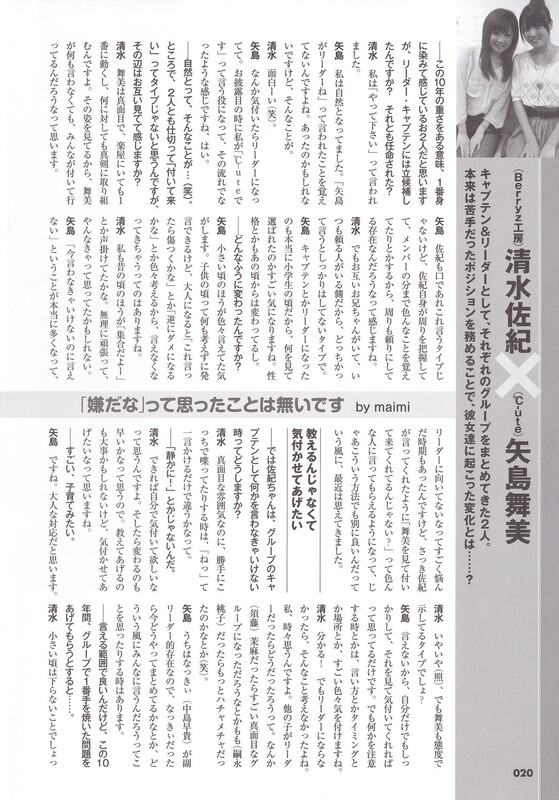 Shimizu: Maimi's serious, she's the one who works the most backstage, and she deals with everything seriously. Seeing her like that, I think that everyone follows Maimi, even without her saying anything. 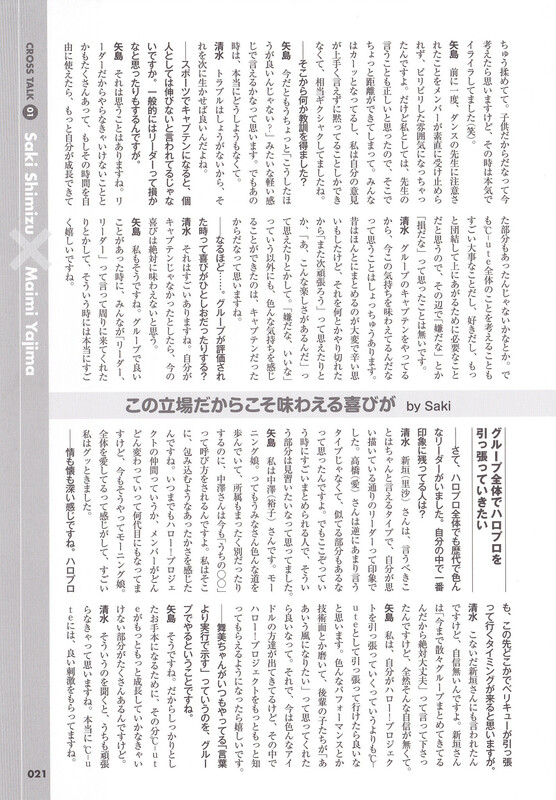 Yajima: Saki isn't the type to flap her mouth either, Saki herself comprehends what's going on around her, and she remembers all sorts of things, including what other members have to do, I feel that she's dependable to those around her. Shimizu: But the both of us have older brothers, and because we had someone we could rely on close to us, neither of us are level-headed types. Yajima: We were really still primary school students when we became Captain and Leader, so we're really interested in what had been considered that led to that decision. Our personalities have changed from that time as well. --- How have you changed? Yajima: I feel that we said all sorts of things when we were small. As kids, we'd just blurt things out without thinking, but as grown-ups, we have to consider all sorts of things like 'It'll hurt if I say this' or 'This might go up in smoke', so there are times when we just remain silent. Shimizu: A long time ago, I'd call out 'Let's gather up!' It was a wasteful effort, but perhaps I thought it was something that I needed to do. Yajima: There are lots of times when you feel 'I'm not saying anything even though I should', and there was a period of time when I was questioning if I was suited to be the leader, but as Saki mentioned just now, a lot of people told me 'Wouldn't they follow Maimi by watching your actions? ', and recently I've been thinking that it isn't such a bad method. Shimizu: I think about this occasionally. How would it be like if another girl was the leader. Like if it was Maasa, would we have become a serious group, or if it were Momo, we'd be much more reckless (laughs). Yajima: For us, Nacky has a subleader-like presence, so there are times where I think how Nacky would bring the team together at a given moment, or how would she say things. Shimizu: When we were small, we would always argue over the smallest things. Thinking about it now, we really were kids back then, but back then we got really irritated with one another (laughs). Yajima: Once before, the members didn't obediently accept the cautions we received from our dance teacher, and the atmosphere got tense. But for me, I thought what the teacher said was correct, and that created a bit of a distance. Everyone had gotten hot under the collar, and I couldn't express my opinions well, all I could do was keep silent, it got considerably awkward. --- What lessons did you learn from that? Yajima: I guess that now I'd mention it in a lighter fashion, something like 'Wouldn't it be better to do it this way?' But at the time, I ended up having no idea what to do. --- I think that beyond this, the time will come when BeriKyuu will lead H!P. Shimizu: Niigaki-san mentioned it the other day, but I've got no confidence. Niigaki-san told me 'We've had disconnected groups come together so far, so it'll definitely be all right,' but I have completely zero confidence. Yajima: For me, more than myself leading Hello! Project, I'd prefer it if we led it as ℃-ute. It would be nice to polish ourselves in various performances or from the technical aspect, so that the kouhais would think 'We want to be like that'. And, now there are all sorts of idol groups appearing, but I'd be happy if amongst them, more and more people would get to know about Hello! Project. --- Maimi-chan does things as a group, always 'demonstrating by actions rather than words'. Yajima: That is so. But in order to be proper examples, there are lots of things that ℃-ute have to develop more and more in order to get there . Shimizu: Listening to that makes me think I have to work hard as well. ℃-ute really gives us good motivation. Click here for more interview excerpts from this book. And now they lead Hello!Project. Saki as a lead role outside, and Maimi as a leader inside.